Conny Malz studied business education and gained initial experience in advising on financial services and IT positions. 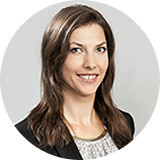 Ms. Malz works as research specialist at Iventa International Management Consulting GmbH. Her focus lies in the search of specialists, as well as executives.